Earlier this month, Russian President Vladimir Putin got behind the wheel of a bright orange dump truck and led a convoy across the Crimea Bridge, a new bridge that links Russia to the Crimean Peninsula. The bridge, which stretches12 miles across the Kerch Strait, is now Europe’s longest bridge. But media coverage of the bridge hasn't focused on its length, or any of its physical properties. That's because the new bridge connects Russia to territory it annexed from the Ukraine in 2014—an action Western governments have called illegal. To many observers, especially those in the Ukraine, the bridge was a political power move, designed to seal Russia's hold on the region. While the politics of the bridge are complicated, its engineering is fascinating. 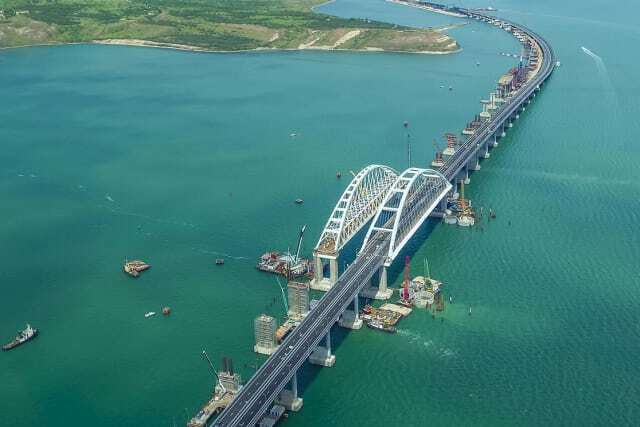 A bridge across the Kerch Strait has been under consideration for more than a century, but has been blocked by brutal geological and environmental conditions. Experts in the area aren’t sure how long the bridge will stand. The first Russian plans for the bridge were put forward by Tsar Nicholas II in 1903, but were then sidelined by wars and economic concerns soon afterward. German engineer Albert Speer picked up the idea for the bridge in 1943, envisioning that it would aid in the Nazi takeover of Soviet Russia. Bridge construction started that year, but was halted by Soviet attacks, and much of the remaining bridge was blown up by the German army during its retreat from the region. The next year, the Soviet Army used the leftover building materials to build a single-track railway bridge across the strait for the wartime Yalta Conference. Part of the conference delegation managed to take the train across the bridge, but seasonal ice floes took out several of the structure’s supports in early 1945, and the bridge was not repaired. More permanent plans were put on hold due to the cost of the project and the difficult building conditions across the strait. After the Soviet Union collapsed, politics became yet another barrier to bridge building. In 1954, Soviet Russia had transferred control of the Crimean Peninsula to Soviet Ukraine, so Russia no longer had control of Crimea when the USSR disbanded. Proposed projects in the 1990s and 2000s collapsed, but in 2010, the two countries finally signed an agreement to build a bridge together. But Russia’s annexation of Crimea in 2014 severely strained relations between the two countries. The Ukraine imposed sanctions on Crimea, effectively cutting off most of its trade and forcing it to conduct trade across the strait with Russia by ferry. These sanctions made goods expensive in Crimea, as well as limited the number of Russia tourists crossing the strait to vacation there. 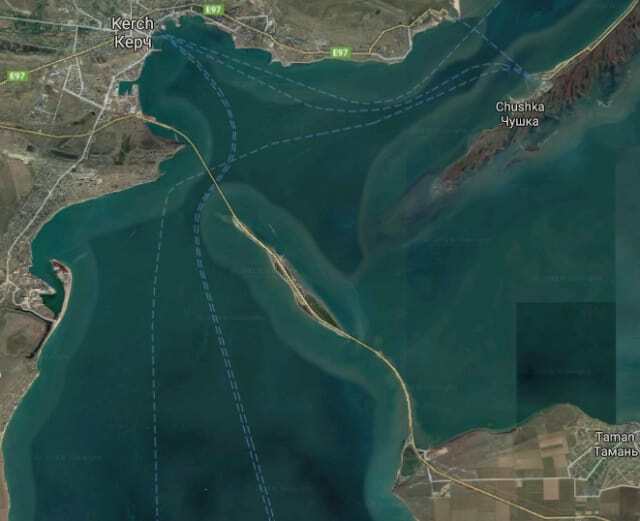 So, in 2015, Putin announced that Russia would build a bridge to the peninsula on its own. In early 2015, the Russian government awarded the 228billion-ruble ($3.7 billion) bridge contract to infrastructure construction firm Stroygazmontazh Ltd. (SGM), a company that specialized in pipelines but which had not previously built any major bridges. The risk of international sanctions made it difficult to attract foreign investment or obtain insurance to cover the project, and SGM eventually used a small Crimean insurance company to underwrite a potential $3 billion loss. The physical environment also presented several barriers to bridge construction. The site's historic significance briefly worked against the project: divers searching the sea floor in preparation for the construction found over 200 bombs and a downed WWII-era plane. The weather also posed problems in the early stages of the project. Leonid Ryzhenkin, the project's construction director, told NPR in 2016 that poor weather had interfered with the work, making it impossible for construction vessels to leave port. To limit weather disruption, SGM put up three temporary bridges to transport workers, supplies and heavy machinery like mobile cranes and piling rigs to the build sites. Despite these disruptions, the project was finished ahead of schedule. And while officials projected that the road portion of the bridge would be finished by the end of 2018, it's already open to light traffic. The finished road bridge has four lanes, with a two-lane railroad bridge planned for the end of 2019. It stretches from the town of Taman in Russia to the city of Kerch on the Crimean Peninsula, passing through Tuzla Island along the way. It covers 4 miles of open water between Taman and Tuzla, 4 miles across the sandy island, and 3.4 more miles of water from Tuzla to Crimea. 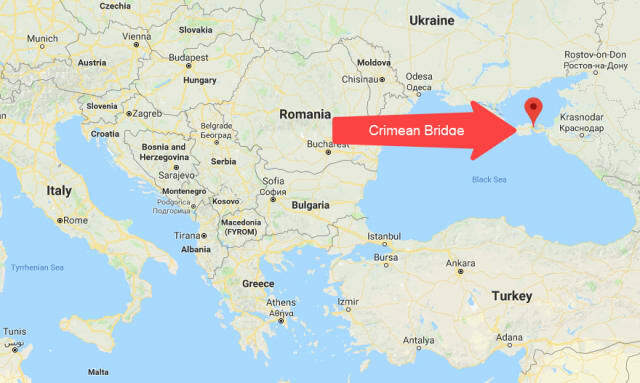 Between Tuzla and Crimea, there is a 745-foot double shipping channel arch, with one arch on the road bridge and one on the forthcoming rail bridge. Both arches have a 115-foot clearance for boats to pass underneath. The arches were built on land and towed out to sea by boat. The road bridge is completed, and the rail bridge is on track to be finished soon. International disapproval hasn’t stopped the project’s construction—or even slowed it. But while the political and economic challenges facing the bridge have largely been overcome, there are other possible threats lurking under the waterline. The Kerch Strait is known to be geologically unstable. A tectonic fault passes through the ocean floor under the strait, and the bedrock is covered in a layer of silt up to 197 feet thick that must be dug through to get a stable foundation. Further complicating matters is that the strait’s seismic activity can make mud volcanoes from the silt. Mud volcanoes are formed when water heated deep in the Earth’s crust mixes with underground mineral deposits, and the mixture is forced upward through a geological fault. As of 2010, Ukraine’s Department of Marine Geology and Sedimentary Ore Formation reported almost 70 mud volcanoes found in the Azov-Black Sea Basin where the Kerch Strait is located. The bridge is supported by over 7,000 piles of three different varieties: bored piles (reinforced concrete piles poured into depressions on-site), prismatic piles (blunt, wedge-shaped supports), and tubular steel piles. These piles were driven up to 300 feet below water level because of concerns about stability. The site’s tubular pillars are arranged in a fan shape, with many of the supports set at an angle, making the bridge more stable in case of seismic activity. But not everyone thinks these measures will be enough to keep the bridge steady on its perilous ground. Civil engineer Georgy Rosnovsky, who previously designed two other possible versions of the Kerch Bridge, is troubled by the current design. He believes that the bridge is necessary, but has stated that he thinks it's being built "in the wrong place and the wrong way." He believes the pilings need to be at least 100 meters (328 feet) long, and worries that they are not sunk deep enough into the bedrock to be stable. 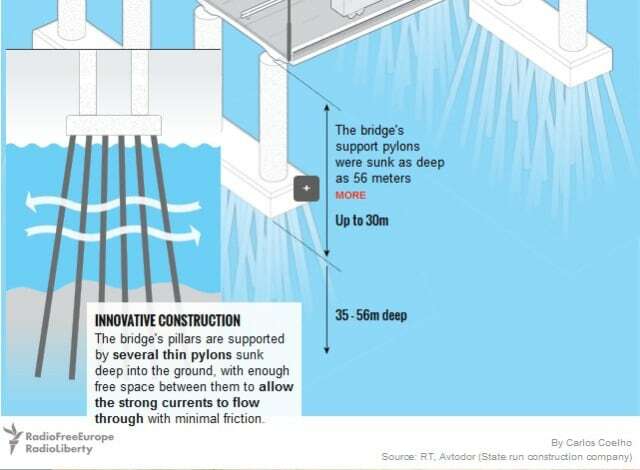 Rosnovsky also thinks that the bridge's spans (the distance between supports) aren't long to allow ice floes through. He planned his 1993 bridge with spans of 230-660 meters (755-2,170 feet), but said that any spans over 200 meters would be safe from ice. The current design's longest span is 227 meters, but most of the spans are much shorter than that. According to Rosnovsky, this design puts the bridge at risk of suffering the same fate as the temporary bridge that was destroyed by ice floes in 1945. Yuri Medovar, of the Russian Academy of Sciences, is another critic of the bridge. Talking to news agency Sotavision in late 2016, Medovar expressed concern that the area hadn't been sufficiently mapped, and that the complex geology and weather conditions would make the structure risky. He warned of the costs of poorly built bridges, citing the 2013 bridge collapse in Borisoglebsk that killed two people. "You can build everything, " he concluded, "but how much it will cost, and how [long will it] stand?" Despite the difficult building conditions, the bridge’s creators aren’t worried about the possibility of collapse. "It will stay intact for 100 years, Rotenberg said in an interview with the Itogi Nedeli weekly news roundup after the bridge’s inaugural drive. “At least. We guarantee that. Everything is done perfectly well." But critics like Rosenberg aren’t satisfied. “It's a rich firm, but it's not built by experts. They think that money is everything,” Rosnovsky told FOCUS in 2016. “The bridges are built from the calculation of the service life of a hundred years, but I think that this bridge will be short-lived."